Erosion control wattles are used around construction sites, storm drains and low flow channels to filter and control stormwater runoff. Often implemented as a pollution control device, these wattles are made from all natural fibers such as coconut coir or straw. These materials are designed to filter out pollutants and then naturally biodegrade over time. This eliminates environmental concerns and removes the need for cleanup or disposal. Wattles are made from a range of different diameters to accommodate different slopes, requirements or water flows. For long erosion control areas, multiple wattles can be joined together until the required length is formed. Biodegradable: This makes the coir environmentally friendly for safe bank restoration. Easy to Cut: This allows you to adapt the coir to your particular location. Lightly Packed: This enables filtering for easier use along banks and in water based locations. Also functions as a BMP around drains. Not sure if the coir wattle is right for your application? Read through our Coir Products FAQ or give us a call! We are always happy to discuss project needs with our customers to determine the best product for your application. In addition to the coir wattle shown here, we also offer Straw Wattles. Looking for something stronger? 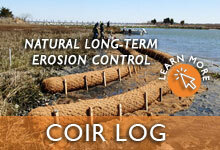 In addition to the coir wattle, we also offer Coir Logs. These erosion control logs will have an extremely similar exterior, but will be much more densely packed. This creates a strong barrier along banks, shorelines and hills. 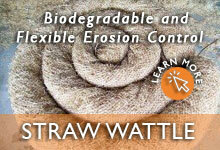 Learn more about Erosion Control Wattles and Sediment Control Products.